The army involves a little bit of travel. 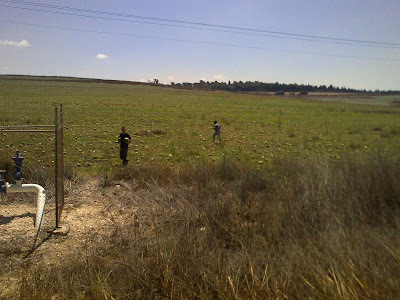 During training you go here or there, to this "shetach" (zone, field, territory) or that. These trips can take a couple hours, which are the absolute best because it means you get to sleep during the middle of the day. In fact, you won't even take a nap during the middle of the day until you're two years and four months in - except for bus rides. So, traveling is awesome. While traveling with a group of sharpshooters late last month for a week of shooting, the bus randomly stopped by some field. We had no idea what was happening until we all heard the bus driver, a crazy guy by the name of Abu, shouting in his slobbering, disheveled voice from the right side of the bus. There happened to be a watermelon field over there. Here was this guy and a veteran sergeant picking watermelons from the corner of the field. They were really taking advantage of that Biblical allowance. Anyway, I couldn't believe my eyes when they picked up a few really big, choice melons from the side. Finally we made off with the produce, just like that. In the army I've seen it all. Honestly, things like this happen all the time. Random occurences are the norm in Israel, but in the army - life is just ridiculous. Not that this is TOO crazy of an incident, but hey, we were in uniform. Before you start the army you think everything is so serious and strict, but really, life is just kinda funny in the IDF! WOW this post had me literally CRACKING UP! The good ole' days of viva la bam. I can only imagine what this "abu" was like... "these vulcan idiots!" Haha. omg... I think I've met your driver. Worked at the grocery store. And drove the Eged bus. And worked in the shuk. Hm. Maybe he's got some brothers.